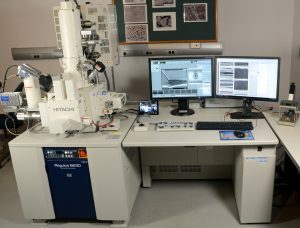 Scanning electron microscopy with energy dispersive X-ray spectroscopy (SEM/EDX) is the best known and most widely-used of the surface analytical techniques. High resolution images of surface topography, with excellent depth of field, are produced using a highly-focused, scanning (primary) electron beam. The primary electrons enter a surface with an energy of 0.5 – 30 kV and generate many low energy secondary electrons. The intensity of these secondary electrons is largely governed by the surface topography of the sample. An image of the sample surface can thus be constructed by measuring secondary electron intensity as a function of the position of the scanning primary electron beam. High spatial resolution is possible because the primary electron beam can be focused to a very small spot (<10 nm). High sensitivity to topographic features on the outermost surface (< 5 nm) is achieved when using a primary electron beam with an energy of < 1 kV. In addition to low energy secondary electrons, backscattered electrons and X-rays are generated by primary electron bombardment. The intensity of backscattered electrons can be correlated to the atomic number of the element within the sampling volume. Hence, some qualitative elemental information can be obtained. The analysis of characteristic X-rays (EDX or EDS analysis) emitted from the sample gives more quantitative elemental information. 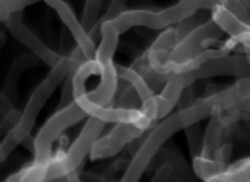 Such X-ray analysis can be confined to analytical volumes as small as 1 cubic micron. SEM, accompanied by X-ray analysis, is considered a relatively rapid, inexpensive, and basically non-destructive approach to surface analysis. It is often used to survey surface analytical problems before proceeding to techniques that are more surface-sensitive and specialized. Low voltage capability available from 10 V. The low voltage capability means that many samples that normally require a conductive coating to reduce charging problems can be examined directly. 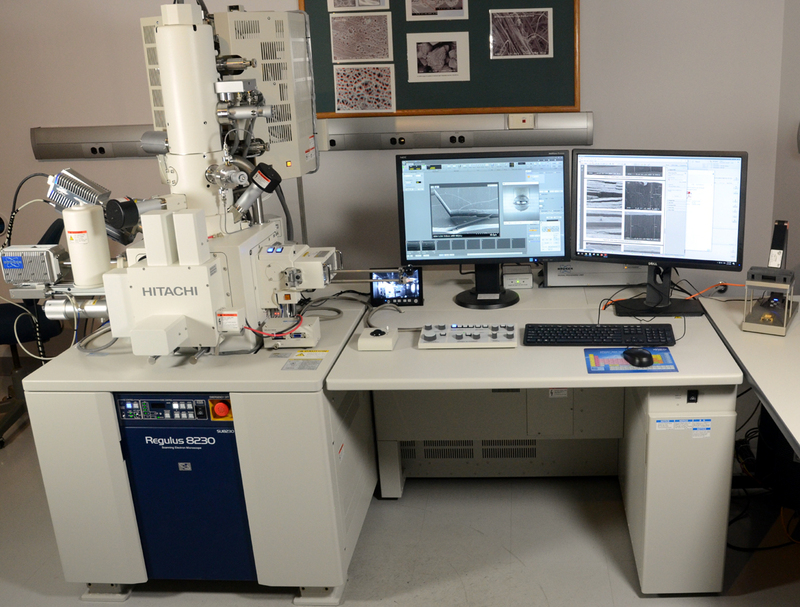 Depending on the application it may be necessary to deposit a thin, conductive coating on a sample in order to minimize charging during SEM/EDX spectroscopy. For routine imaging and EDX analysis a thin coating of carbon or gold coating can be used, while chromium or iridium can be used for ultra-high resolution imaging. Surface contaminants from sample handling, cleaning residues and even exposure to air can reduce high resolution image quality by electron beam deposition of hydrocarbons. The Zone II cleaner uses a combination of ultraviolet (UV) and ozone to remove hydrocarbons from a sample surface, without any damage to the sample surface.